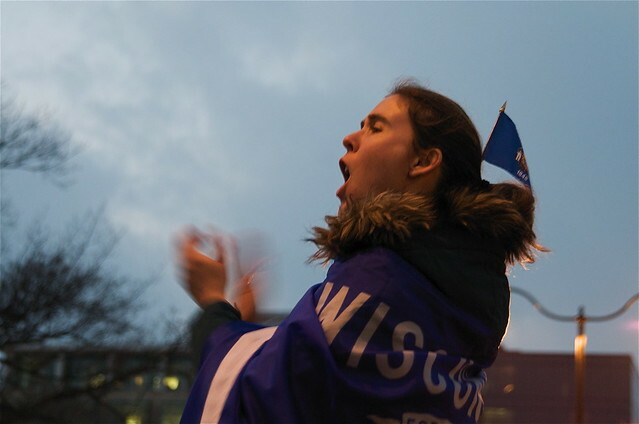 Today was Day 4 in the ongoing protest in the capitol city of Wisconsin. Again today, in excess of 20,000 teachers, students, fire-fighters, bus drivers, garbage collectors, maintenance people, electricians, plumbers, families, young people, old people took to the street and marched on, and into, the capitol building. We were protesting the radical "budget bill" the newly elected Republican governor is trying to ram through without discussion. Among other things, the bill would terminate collective bargaining for all city workers and effectively break the back of public unions. Those things, of course, have nothing to do with the ginned-up fiscal crisis the Governor is creating to make this transparent power grab. Republicans across the country have been gunning for labor unions all year. Republicans are NO FRIEND to the working class of America. Wisconsin is first on the block. Other states are sure to follow. 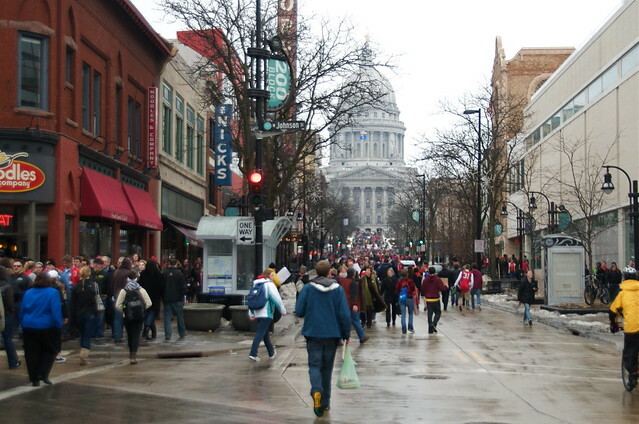 In the words of a friend, Wisconsinites "are as happy to take to the streets for union causes as they are to go to a Badgers/Packers game. It's the same joyful sense of community." And take to the streets we have. Day and night for four solid days. There has been 80 hours of public commentary aimed at our legislators. Sometimes quietly, sometimes vociferously. The bill was supposed to come up for a vote late this morning so that the Governor could unveil his Bold! New! Plan! later today, not at the state capitol where the business of the people is conducted, but rather at a corporate site. One of his financial backers, no doubt. Corporate cronyism, wrapped in the flag. Unfortunately for him, 16 senators had another idea. Those Sixteen - all 14 Democrats and 2 Republicans - left the state. Rumor has it that, when charged with retrieving the missing senators, the law enforcement department (unionized...) refused to carry out that charge. The Sixteen are now out of the state, and will remain so until they deem it appropriate to return. 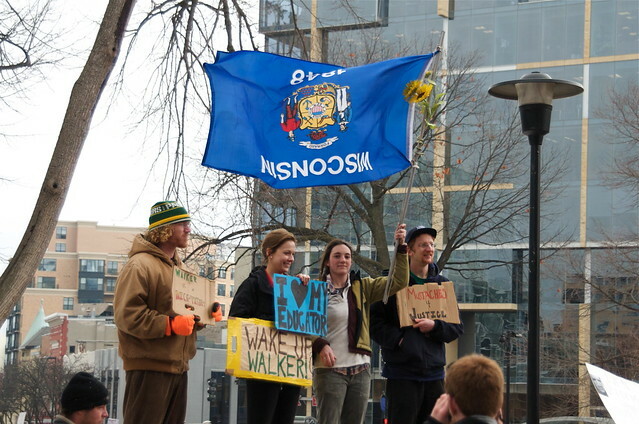 Early statements indicate that will happen when Governor Walker agrees to actually meet and discuss his proposals with those who will be affected. You know, ruling through dialog rather than fiat. Democratic-like. Wisconsin has garnered the attention of the national media at last. Last night and today our plight - and it is a plight - were aired on CNN and MSNBC, and perhaps other networks. Articles ran in the New York Times and the Guardian UK (the most accurate, ironically enough). Tonight there were numerous media trucks in evidence, and sorta-lefty Ed Schultz was doing his MSNBC show live from Madison. Tomorrow will bring more of the same. This fight is not over. This Governor is a believer who thinks he knows the answer. He is paternalistic and unreasonable. He will not change his mind. Like W, he's a decider. Like W, he sees himself as smarter than everyone else. Like W, he is an idiot. We have delayed the vote. We have rattled the cage. We have the attention of the legislators and the media. Hopefully, some of those legislators will realize that this bill over-reaches, and a more moderate approach is prudent. As a final warning to my fellow Wisconsin citizens I offer this: Do not be so relieved that "the worst" has been averted that we settle for "bad". There are more photos in a SLIDE SHOW. The set contains photos from all 4 days, but the most recent ones are first. Good luck guys! Here's hoping that clueless coward that calls himself governor grows a brain. I am really worried that we'll get negotiation and concessions on the labor-related parts of the bill, but there are other, really atrocious parts of the bill that need to be cut out, too.